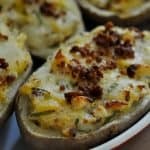 If your looking for a way to use up leftover baked potatoes you’ve got to try these Loaded Twice Baked Potatoes. 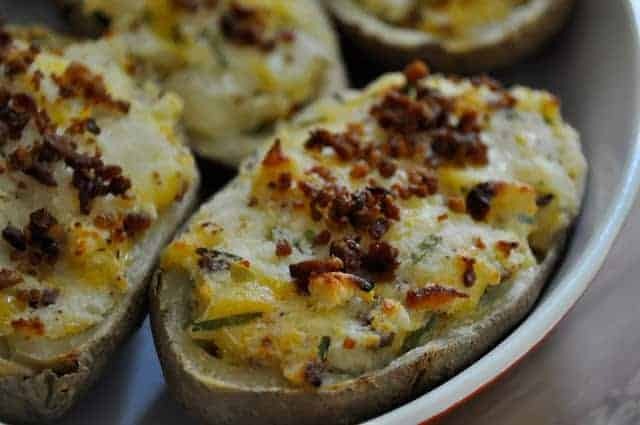 They’re such an easy side dish that everyone happily eats you may find yourself making extra baked potatoes just to make this recipe. 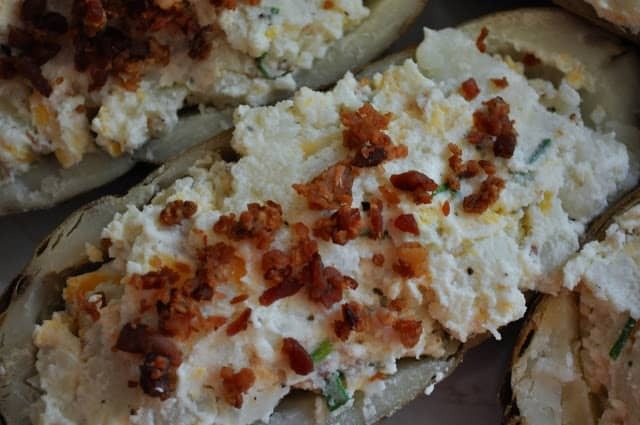 And for the record I ALWAYS make extra baked potatoes because my kids eat like lumberjacks, uh minus the flannel and suspenders that is. 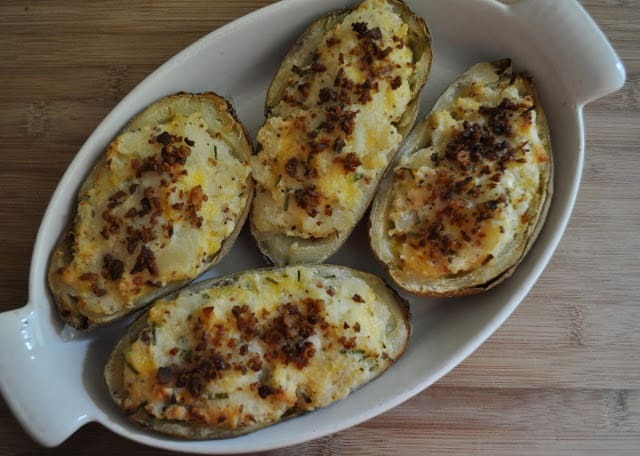 I’ve gotten in the habit of making about double the baked potatoes we normally eat because I keep finding handy ways to use already cooked potatoes. Hash, home fries, breakfast or dinner skillets, breakfast burritos and if they last more than a day or two I just chop them up freeze them and add them to the next batch of soup I make as a nice way to stretch the soup AND thicken it at the same time. And as for cooking them in summer months? 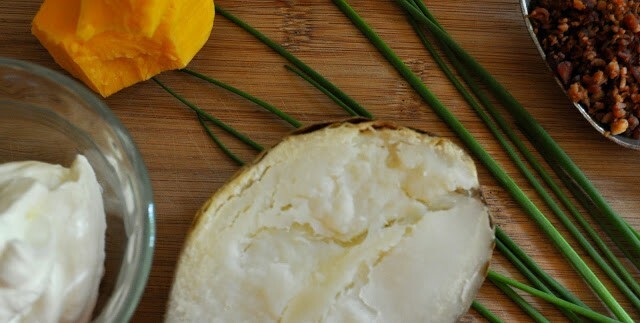 EASY just wash, poke with a fork, wrap in foil and drop in the crock pot/slow cooker for 4-6 hours on high. Use what potatoes you’ve got, if you have giant ones maybe double the add in ingredients to make sure the flavors shine through. 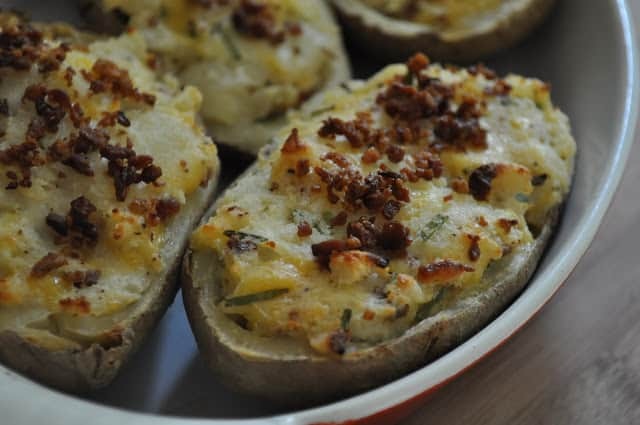 If you only have smaller potatoes the recipe will work too, it will just make more stuffed potatoes. And as always, if you despise an ingredient add your own substitutions and make this recipe work for you. The recipes should inspire your meals, not make you buy more ingredients you don’t have, so go with what you’ve got! Well you wrote this post just for me, obviously! Potatoes are my absolute favorite food and I usually at them once a day in some way or another. Thanks for sharing another great way to cook them!